Empathetics, Inc. believes that while many factors contribute to the cultural transformation of any organization, an important first step is training healthcare professionals to build relational and communication skillsets. This will promote an environment of patient and family-centered care. Healthcare providers and staff can participate in the eLearning programs and have follow-up facilitated discussions. This facilitator’s guide provides a framework for a blended learning experience by incorporating group exercises, group process, role playing and experiential learning. 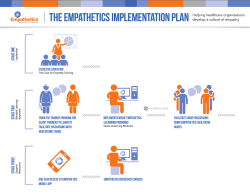 This blended learning strategy serves as an opportunity to deepen the Empathetics web-based curriculum by allowing participants to apply their learning to actual patient interactions that have challenged their own confidence and empathy. The Empathetics App serves as a portable reminder of key concepts from the courses and contains valuable information to keep you up to date with the skills you learned in the training. 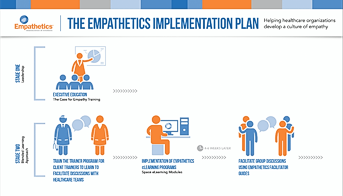 The Empathetics E.M P.A.T.H.Y.® Web-based Training Program incorporates translational research in the neurobiology and physiology of emotions to improve patient and healthcare provider relationships with an emphasis on physician, nurse, and allied health professional empathy. Using didactic and experiential learning, participants will explore the basic science of emotional connection and empathic communication. Participants will practice techniques to enhance perception of their own and others’ emotional states and cultivate interpersonal skills for optimal interactions between patients and clinicians. Thank you for your interest in Empathetics, Inc. For more information you may contact us at info@empathetics.com or call 844.407.2755.